We at EME Technologies aims at providing quality technological training to turn our students into high profile professionals. 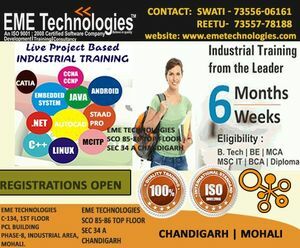 Towards the fulfillment of our aim we have taken one more step by launching best Industrial Training Program for our budding programmers. Take the 1st step & send us your updated resume immediately.